“Spock or Treat!” The episode “Catspaw” aired four days before Halloween, 1967, and was intended to be a “treat” for the younger fans, with Star Trek being aired on Friday nights at 8:30 p.m. on NBC. How did the episode go over with the critics? And the public? The critics were blown away! Today’s top TV shows are previewed and selected by Steven H. Scheuer and his “TV Key” staff of experts who watch the screenings, attend the rehearsals and analyze the scripts in New York and Hollywood. “Catspaw” … is a good show for Halloween. On a strange planet, the Enterprise encounters a weird alien pair (played by Antoinette Bower and Theodore Marcuse) who seems to deal in illusions and haunted houses, but are more concerned with controlling the invaders. The character of the girl called Sylvia should particularly appeal to male viewers who would like their girl friends to look a bit different on each date! This is a scary show, set on a dying planet with most of its people gone. 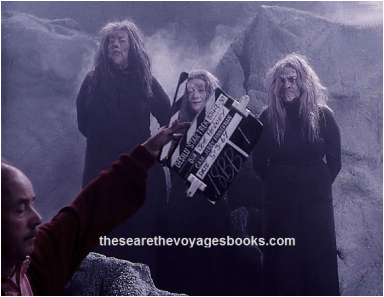 There are plenty of dungeons, witch-types, and other horror show props, including guest star Antoinette Bower, who is very effective as the planet’s leader. She is determined to save her race and is equally determined that Captain Kirk should help her. The ratings were good, too. There was no beating the double-punch of TV’s Top-rated series Gomer Pyle, U.S.M.C. and the CBS Friday Night Movie, but Star Trek came in with a respectable second place showing on this night, as with most nights during its second season. 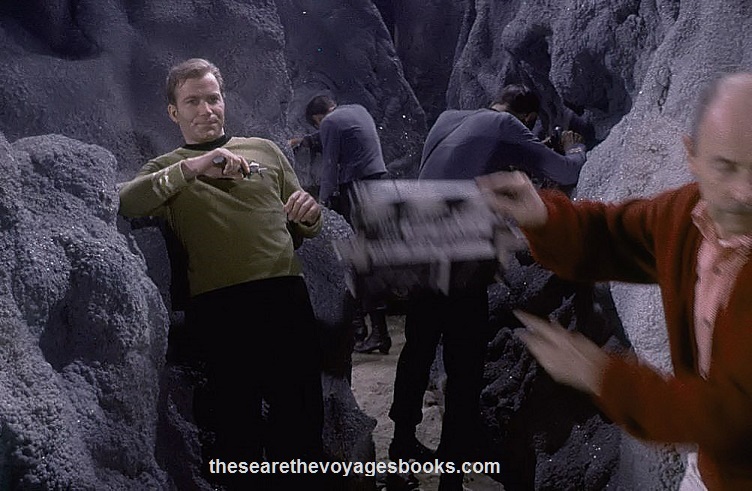 See all the reviews, all the ratings, and all the stories about the writing, the making, and the first broadcasts of all the Star Trek episodes, in the Saturn-award winning book series, These Are the Voyages – TOS: Season One and Season Two, and Season Three. For the best prices anywhere (buy them together and save even more! ), and to get your copies autographed by author Marc Cushman.